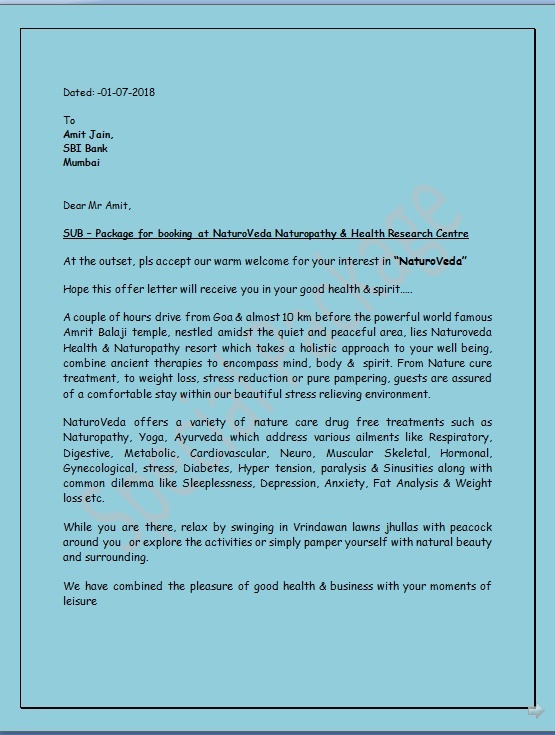 Hope this offer letter will receive you in your good health & spirit…..
A couple of hours drive from Goa & almost 10 km before the powerful world famous Amrit Balaji temple, nestled amidst the quiet and peaceful area, lies Naturoveda Health & Naturopathy resort which takes a holistic approach to your well being, combine ancient therapies to encompass mind, body & spirit. From Nature cure treatment, to weight loss, stress reduction or pure pampering, guests are assured of a comfortable stay within our beautiful stress relieving environment. NaturoVeda offers a variety of nature care drug free treatments such as Naturopathy, Yoga, Ayurveda which address various ailments like Respiratory, Digestive, Metabolic, Cardiovascular, Neuro, Muscular Skeletal, Hormonal, Gynecological, stress, Diabetes, Hyper tension, paralysis & Sinusities along with common dilemma like Sleeplessness, Depression, Anxiety, Fat Analysis & Weight loss etc. While you are there, relax by swinging in Vrindawan lawns jhullas with peacock around you or explore the activities or simply pamper yourself with natural beauty and surrounding. We have combined the pleasure of good health & business with your moments of leisure. Please find our charges hereunder for your necessary action. For Detoxification / Rejuvenation Plan, we prefer minimum 7 days stays and it can be extended as per your choice, subject to availability. The above rates are inclusive of Comprehensive NATUROPATY & YOGA TREATMENT ( Jal Neti, Sutra Neti, Yogic Exercises/ Pranayam, Mud Patti, Mud Bath, Anema, Oil Massages, Powder Massages, Steam Bath, Water Sprinkler and much more……) under expert guidance. It is inclusive of regular Health Meals (Sprout / Juices /Lunch / Dinner ) also. We hereby offer you 40% Special Discount on above charges. One time Doctor’s Consultation /Regn fee of Rs 2000/- per person is also applicable. You are required to deposit the requisite amount in the accounts detail given hereunder and intimate us to confirm your booking to our “NaturoVeda Naturopathy & Health Research Centre”. In anticipation of your prompt response. 1) We book against payment of full basic charges. Amount to be deposited in bank account of “ Naturoveda Private Limited, SBI, Mumba Branch, A/c No – 123456789124, IFC Code – SBIN0012345678. 2) Management reserves all the rights of booking & cancellation. 3) Please check the availability of dates from us before making your final plan to visit NaturoVeda. 4) Only those who are seriously interested in purification of soul , mind & body take the admission. Bookings once made cannot be cancelled. Dates can be adjusted on request of client at the discretion of management. 5) It is a centre for overall growth and relaxation of body through Naturopaty treatment, Yoga, Meditation, Pranayam, Vedic Treatment. Any critically / terminally ill patients should not take admission by suppressing their medical facts. Results of treatment is subjective and majorly depends on the cooperation, willingness & interest of the patients during their stay with us. 6) Any special treatment, if required / desired, will be charged extra with the prior approval of the client. 7) This offer letter is valid for 7 days from the date of this letter. 8) Credit Cards / Debit Cards are not accepted.